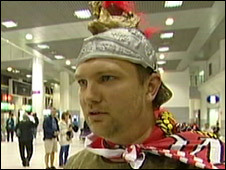 Disappointed Manchester United fans have been arriving home from Italy after their team's defeat to Barcelona in the Champions League final. 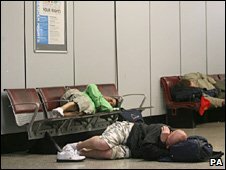 A steady stream of weary supporters arrived at Manchester Airport in the early hours of Thursday. Many spoke of their disappointment at the 2-0 defeat, but insisted the trip to Italy had been worth the effort. Thousands of fans also watched the game in pubs and bars in Manchester. Police said there had been 11 arrests. Ten of the arrests were for public order issues and one person was arrested for assault, a spokesperson for Greater Manchester Police (GMP) said. Police in Rome said United and Barcelona fans had been "good-natured" in the run-up to the game, although some arrests were made over ticket touting. A British man was stabbed on Tuesday night, taken to hospital and released after treatment. Greater Manchester Police are helping in the investigation. Italian police said the incident happened on the banks of the Tiber River, close to Vatican City. About 30,000 Manchester United fans were in the city for the final, with a similar number of Barcelona fans. In Manchester, thousands of supporters had crammed into the city's pubs and bars to watch the game. At Sam Platt's pub just a stone's throw from Old Trafford, the crowd's pain at the final whistle was palpable. Lorry driver James Loney, who had travelled from Lurgan, County Armagh to watch the match, said he was devastated. He said: "There's no point in pretending otherwise, but I've been a United fan all my life, 40 years. "I'm devastated but you have to take the rough with the smooth." Emma Parish, 34, from the Manchester United Supporters' Trust said: "I'm disappointed but we still won the League. "It's been fantastic in here - as soon as the whistle went, within a few minutes everybody was singing again. Plans for a victory parade through Manchester's streets have been cancelled. FC Barcelona, who also won their domestic league and cup, last won the top European prize in 2006.